The trek over the Kuari Pass was the route followed by Shipton and Tilman on their way to the Rishi Gorge and by other mountaineers en route to the peaks on the Indo-Tibetan border. It is also called the Curzon Trail, as the famous former Viceroy of India also travelled this route. 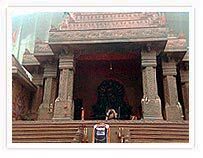 The trail was named after Lord Curzon who was a keen trekker and it is said that the path was specially improved so that he could do the trek. The crossing of the pass is a fitting conclusion to a trek that takes in three lesser passes and five major rivers - the Pindar, Kaliganga, Nandakini, Bheriganga and the Dhauliganga. Rishikesh is well connected by train and road from Delhi and located at a distance of 250 kms 5 -6 hours drive. Rishikesh is a religious centre and famous for Temples , Yoga Ashrams and Rafting on River Ganges. Start early in the morning to Debal. You begin by driving uphill along a hilly road which snakes up the valley past Deoprayag, the confluence of the Alakananda and Bhagirathi rivers, and through the town of Shrinagar, once the capital of the kingdom of Garhwal. Debal is a small settlement situated in a narrow sloping valley. Camp is set by the Pindar river on an open grassland. From Debal, the road runs up, following the old footpaths to the village of Mandoli. From here you follow an old pony track. The first day's walk is not too steep and often sheltered by the beautiful pine woods that fill the valley. Camp is set among shrines on the top of the ridge, about 500 m above Mandoli village. A long traversing descent through rhododendron forests and across a beautiful clearing is followed by a climb to the main valley, at the head of which is Wan. A gradual walk through the village brings you to the Forest Rest House and Tourist Bungalow. Camp is set up near the Rest House. 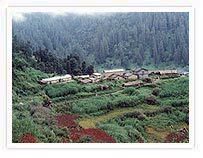 Wan is the biggest village in the Neel Ganga Valley, having a cluster of houses spread around the valley with Lohajung Khal to the left and Kokin Khal to the right. Just above the Tourist Bungalow is the sacred grove of Latu, a local devta (spirit) whose temple has one of the biggest deodar trees in India. Walking on past Latu's temple, the path climbs up through magnificent cypress trees to the beautiful towards Kukin Khal (10,300 ft/3,121 m), reached in about two hours. There are two graves here. The path then drops to broad meadows with the track marked with stone rows on each side. An hour's walk takes you to the end of the broad meadows to near Kunol. From here the track drops down east, again on a long undulating traverse, through magnificent forest filled with monkeys, to the confluence of two rivers, to the campsite below Sutol. A short climb brings you to Sutol, a lovely village with paved alleys and slate roofs. The track now traverses along the valley with a number of ups and downs and huge drops down to the river gorge below, through fragrant forests of fir trees. After dropping to a river, crossed by a green girder footbridge, there is a long steep climb to a little temple on a Col at 8,200 feet (2,485 m). From here, passing fields and smallholdings and dropping once again to a side river, there is a good spot to stop for lunch. An upper track leads to the bridge and then a gradual climb through forest emerges near farms and fields to a splendid campsite near Dekhandhar, set on a ridge, with amazing views of Trisul. A short day with a traversing path to start with, passing through attractive small villages such as the outstanding Ala, with a house with magnificent carvings on the porch. As always, there are quite a few ups and downs, cutting into side valleys. Stop for lunch by a side stream before you reach the campsite, some half an hour's walk away from Ramani, set in lovely pine woods. There is time to walk into Ramani, a typical Garhwali village with friendly people and attractive houses with heavy slateroofs and paved alleys surrounded by fertile fields. A long day. Start with a 1,000-foot (300 m) climb on a good zigzagging track leading to open grassy grazing meadows. Snow peaks begin to emerge above the forest, to the north. Continue ascending steeply, as the path moves diagonally through forests of rhododendron, pine and holm oak, with more pastures for summer grazing dotted with shepherds' huts below, to your right. You may come across flocks of sheep and goats moving along the track. 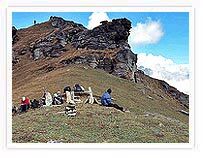 The highest point - Ramni Pass, also called Binayak Top - is reached in about three hours from camp. There are magnificent views of Trisul through the trees and from the open meadow. It is also possible to make out the Kuari Pass, still at least three days' walk away. From now on, you may have a chance to see the multi-coloured Monal pheasant, though they are very shy, being hunted by the locals for the pot. From the pass, the path goes gently down across more pastures and open glades, then into lovely forests of horse chestnuts and walnut trees with waterfalls. The track, most of it paved, now starts a steep zigzag descent to the small village of Jhi, where camp is set for the night. A short day. A steep descent from the camp past small farms brings you down through woods to the spectacular suspension bridge at 6,037 feet (1,830 m) across the Birehi gorge, inhabited by a large number of monkeys. From here a very steep climb takes you back to 7,382 feet (2,237 m), where the track eases after about an hour and a half's ascent. From here the path is almost flat, passing through fine rhododendron forest with long-tailed magpies flitting about. There are many streams and waterfalls as the route contours around many deep re-entrants. Looking down to the deep gorge below, you can see the landslide and the Gauna Lake which burst to flood the whole of the Ganga Valley down to Rishikesh in 1898. After going around the head of a horseshoe valley, you reach two lovely rivers cascading down under the path. From here it's a short climb to the campsite at Kalighat. A long and spectacular day. The route traverse above the village and then starts a steep climb up into rhododendron forest, with many zigzags - it is a broad, well made track but after quite a number of false summits, a Col is reached at 9,842 feet (2,982 m). The path now descends gently, traversing along the valley, to open meadows with views across to the Kuari Pass. The track then traverses down around the side of the valley, across several streams, before it plunges down a very steep and loose section, much of which has been washed away by the monsoons - an awkward and loose descent. At the bottom, you will see that the river has cut through a deep rocky dramatic gorge, to your right. This is wild country and there are no settlements, while blue sheep and the Himalayan black bear are said to be roaming here. From the river, it is a very steep climb of about 3,000 feet (900 m) with a small break about half the way up to cross a large stream. A final climb brings you above the tree-line to the campsite on the large pastures where sheep and goats graze in summer. The Kuari Pass towers above. "We breasted the slope and halted, silent on the path. No words would express our delight. The Himalaya were arrayed before is in a stupendous arc". Camp is set either on a high meadow along the ridge and across a small stream or lower down, in a forest clearing with wonderful views of the surrounding mountains. The blinding vision of snow peaks makes all the effort worthwhile, for it is often said that this is one of the greatest mountain views in the world. A long way below lies Tapovan, a day's walk away. If conditions are right, watching the sun set of the ring of mountains is a breathtaking experience. The trail circles around the curving meadows to the left and descends gradually to the lower parts of the grazing grounds. Then descend steeply for about four hours through rhododendron, oak and pine forests to the village of Kulari. Cross Kulari nallah (stream) and walk gradually along it, bypassing a number of villages and their fields. Walk for another 30 minutes along the small canal jutting out of Kulari nallah, taking a right turn till you reach the hump overlooking the Dhauli Ganga valley, with Dunagiri right across the river and the village of Tapovan, known for its hot sulphur springs, right below, next to the road. Descend for another 30 minutes to the roadhead where vehicles are waiting to drive you to Joshimath for overnight stay in a simple basic hotel. From Joshimath, drive north for about 10 km to the road-head at Govindghat. 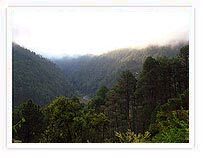 Crossing the Alakananda bridge, the trail through tall fir, surai and deodar trees, follows the right bank of the Bhyundhar torrent. The winter retreat of the Bhyundhar villages falls on the way. The Kakashbhushandi torrent joins the Bhyundhar here. The ascent up to Ghagharia continues, the treeline constantly keeping you company. Trek up to the Valley of Flowers. A gentle walk up to the log bridge of the Pushpawati torrent; its edges are covered with flower stems. The trek then leads through a narrow gorge with birch trees. Camp just outside the valley. You are free to explore and trek in the valley during the day. Return to the campsite for overnight stay. Walk back to Govindghat and take a short drive to Joshimath. Overnight in a simple hotel.